How would you like to upgrade your business’s visibility and outreach? Would you like to add new signage to your interior office space that can easily be rearranged? At SpeedPro, we’ll design and print custom banners to visually brand your business in both indoor and outdoor settings. With our banners, you can believe you’ll be making a statement and attracting the attention and curiosity of people walking by outside your building. If your business or organization is located in Franklin, Brentwood or Nashville, reach out to our studio to get started on your next visual marketing project. Our team of professionals will coordinate with you to understand where your banners should go, what they should display and how they should be arranged. Let’s get started! At SpeedPro Imaging Nashville South, we pride ourselves on the quality of our banners. We know that to make an impact with our designs, we need to focus on two specifications: durability and versatility. After a few years of crafting banners, we have perfected our vinyl business banners for all your needs. We produce all of our banners with vinyl material. 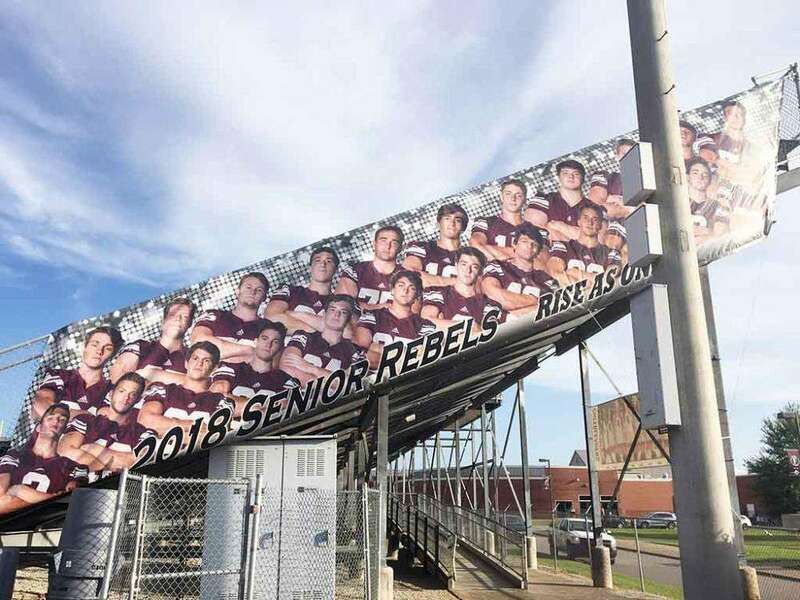 Though you can choose from different types of vinyl — scrim, smooth and more — they will all ensure that your banner can withstand time and external factors. Because of the thicker nature of vinyl, it’s hard to rip and destroy our banners. Our fade-resistant inks also pair well with the vinyl, ensuring that even after several years, your designs will still be bold and impactful. If you’re going to be displaying a banner outside and you’re worried about the windy conditions, you’ll be happy to know that we offer mesh vinyl. This mesh allows for up to 70 percent air flow, allowing you to keep your banners on display during thunderstorms without fearing it will be torn up afterward. Another benefit of our banners is their versatile nature. 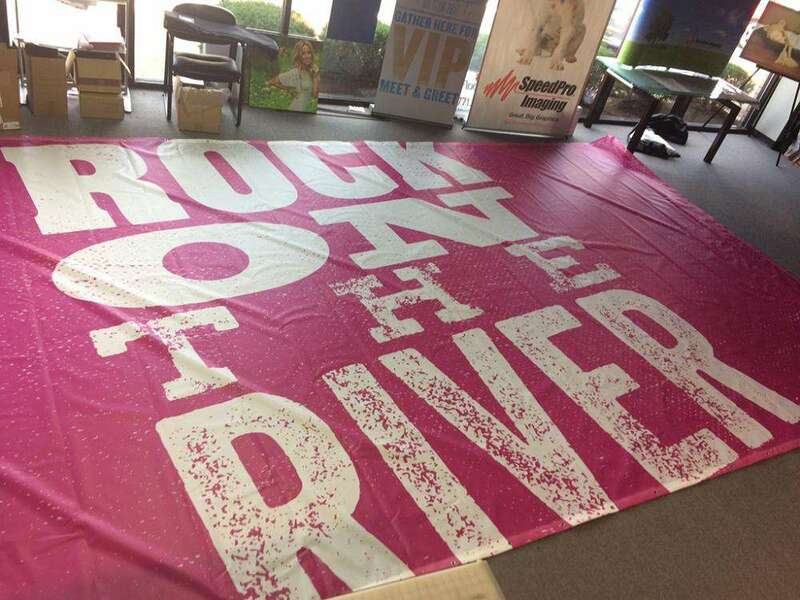 You can easily transfer an outdoor banner to the inside of your office and vice versa. Many of our banners get hung from the ceiling with grommets or banner poles. You can continue to display your banner in this way, no matter the setting. 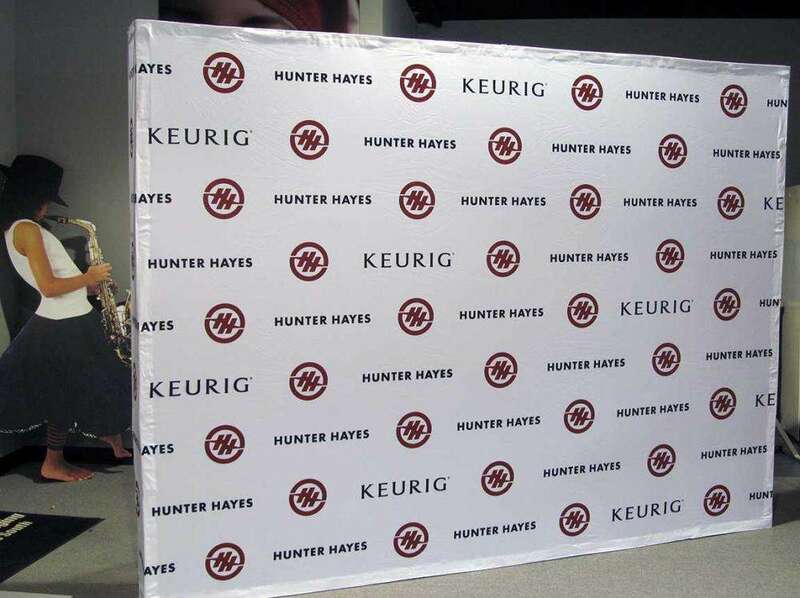 You may also choose to use a banner stand, which can also be easily transported inside and out. 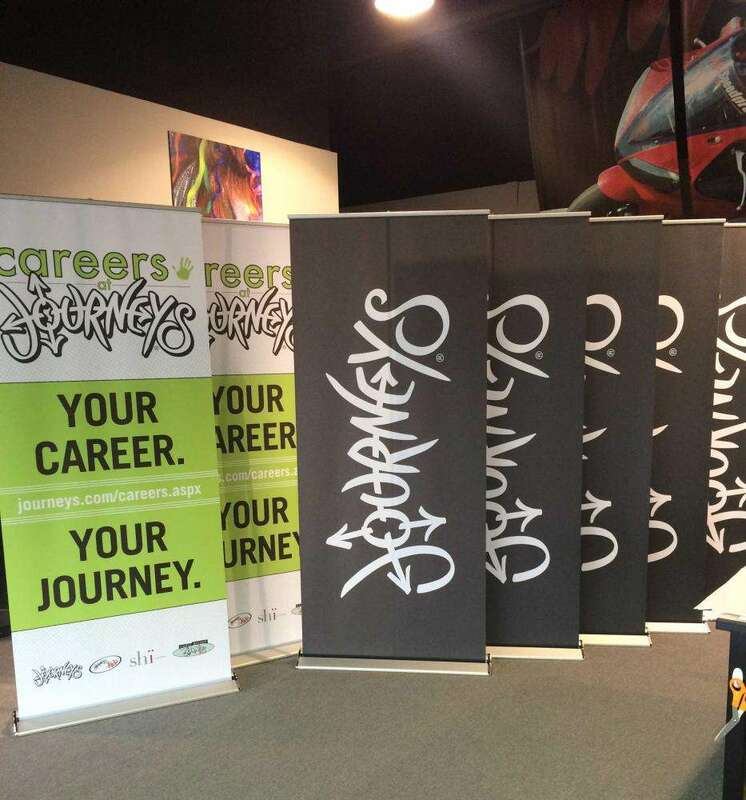 As mentioned, the versatility of our banners allows them to be hung from above by grommets or banner poles. Grommet rings are sewn into the fabric of the banner and then double-hemmed to ensure they don’t get ripped. 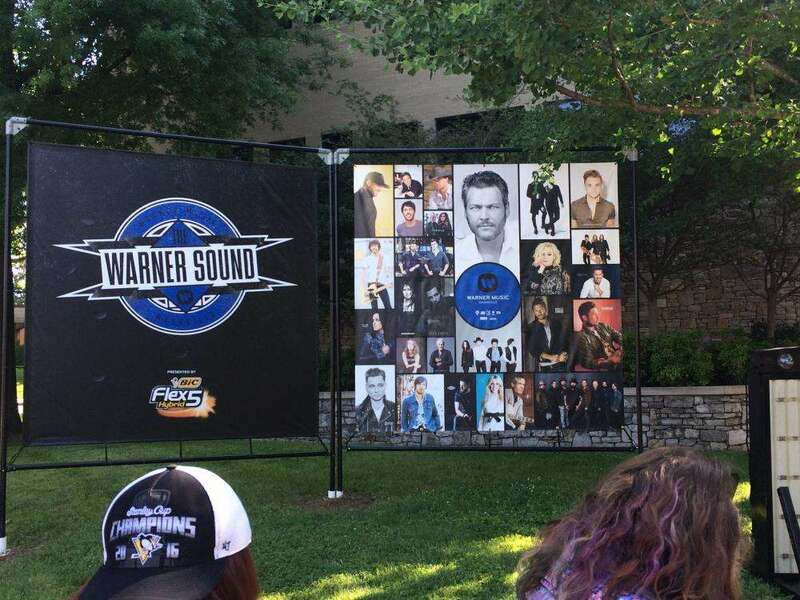 Once they’re hung from the hooks, which are spaced evenly apart, your banner can hang down with an even weight distribution, ensuring it won’t wrinkle up or become unreadable. If you’re looking to display your banner with a pole, we’ll sew a pole pocket into the edge of it. Then, you can show your new marketing element at whichever angle you’d prefer, whether that’s from the ceiling or angled off the side of your building. If you want to add additional signage to your indoor and outdoor business areas, check out our line of custom business banners! We’ll design everything with your brand in mind, making sure customers will be able to read your message in any setting. Call our studio today, and we’ll quickly set you up with a consultation appointment.